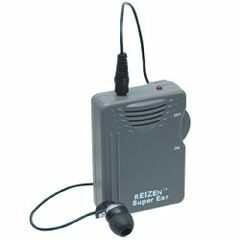 The Super Ear Hearing Enhancer is an affordable, portable personal sound amplifier with up to 120dB gain. It features a built-in microphone for clear and loud delivery of sound through the included earphone. Clear Reception. Easy Controls. Durable. Lightweight. Sturdy. both parents in rest home. Works greart for my 97 year old aunt in the nursing home. Would like a different type of clip type holder to make it easier to clip on clothes and 2 ear bubs would be more helpful. Clear Reception. Easy Controls. Lightweight. I use the device in group gatherings. I like the volume and the device has clear reception with no unnecessary bass or other sound modification. It is small too, that's good. The only part I don't like about it is the that the clip doesn't really have tension and when I stand or move about it slips off my belt. Overall a good buy. Works well. Uses regular batteries. Easy Controls. Clear Reception. Lightweight. Uses regular AAA battery. Sturdy. Mother still won't use it. Tech Savvy. Professional. Practical. full time father. full time father. both parents in rest home. This seems to work well and is worth the money, but my mother (age 89) still won't use it. To be fair she won't use anything including regular hearing aids. The fact that this unit uses regular AAA batteries makes it a winner. The other units I looked at use hearing aid type batteries and they are very expensive and don't last as long. I also like the fact that in order to turn it off you also have to turn the volume to minimum so when you turn it back on the volume starts low and won't blow someone's eardrums out. Works well at all volumes. Doesn't block background noise but I don't expect it to. by Roy from Hanover, Ma. The super ear hearing enhancer. If it doesn't help me is it able to be returned for a refund? There is so questions about battery size. Are they standard AAA baterys ? Because some reviews say they are not. Asked on Jan 5, 2015 8:40:44 AM by Firerob55 from Milford ma. The ear piece goes into the person's ear and the mic gets set on the table between the person speaking and the user. It works better than the ones that are all up by the ear because the user's own voice isn't amplified. Mother hated her over-the-ear amplifier because her own voice was so loud. Does it have a clip on the back to clip to pocket or belt? Will a regular pair of headphones plug into this? its for my mom who's 90 and she doesn't like the ear buds. Yes a pair of headphoes can plug into this.